Jurgen Klopp's decision to drop goalkeeper Loris Karius was vindicated on a night when the brilliance of Adam Lallana swept Liverpool to a 3-0 win over Middlesbrough at the Riverside Stadium. Klopp replaced Karius - responsible for errors in recent games against Bournemouth and West Ham - with Simon Mignolet and the Belgian responded with a brilliant one-handed save to deny Viktor Fischer moments after his side's opener. Otherwise Mignolet saw little action as Liverpool mightily impressed, building on Lallana's close-range opener on the half hour to dominate the second period and increase their lead through Divock Origi then Lallana's second. It was precisely the kind of reaction Klopp had called for after their calamitous final few minutes against the Cherries was followed by a frustrating 2-2 draw against the Hammers which left them looking anything but title contenders. Those recent dropped points ensured Liverpool started the game six points behind leaders Chelsea but they began with plenty of intent, Lallana fizzing an early shot from long-range which was blocked by Calum Chambers. 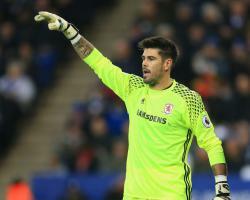 But Boro matched them for pace and endeavour with Fabio marking one of the better halves of his Boro career by drifting in from the left and firing a shot straight at Mignolet from the edge of the box. Mignolet was called into action again midway through the first period when Boro captain Ben Gibson headed the ball into his arms from Adam Forshaw's left-wing free-kick. The visitors snatched the lead on the half-hour when Nathaniel Clyne was given space to attack down the right and Lallana headed home his cross from point-blank range. Moments later, Mignolet justified Klopp's decision by denying Fischer, who cut in from the Boro right and fired a rising shot from a tight angle. Goalscorer Lallana got back to block a goal-bound effort from Marten de Roon, but Boro's anxiety to grab an equaliser almost caught them out when Roberto Firmino put through Sadio Mane, who hit a low shot across Victor Valdes and against the post. Mane had two shots blocked in a furious start to the second half by the visitors, prompting Boro boss Aitor Karanka to make a double substitution and throw Stewart Downing and Grant Leadbitter into the fray. It was all in vain as Liverpool extended their lead on the hour mark when neat work by Georginio Wijnaldum set Lallana free on the right side of the box and the in-form midfielder crossed for Origi to sweep home the simplest of chances. And eight minutes later it was game over as referee Jon Moss waved advantage when Mane was fouled on the edge of the box, allowing Origi to cross for Lallana to score his second from eight yards. The visitors cruised through the remaining minutes, pinning Boro back into their own half, and Lallana was richly deserving his ovation from the Liverpool supporters when he was replaced by Lucas Leiva in the 82nd minute. Jordan Henderson drilled a low free-kick into the Boro wall before the hosts' last shot at a consolation petered out in comical fashion when Adama Traore completely mis-judged a deep left-wing cross from Downing.